Sharp-eyed readers here noticed that the lenses in HRC’s glasses were more complex than the usual coke-bottle ones we are accustomed to seeing on her. We knew she used her considerable persuasive skills to return to work somewhat earlier than her doctors might have wished due to remarks she made in a conference call while she was still recuperating at home. We also know she wants to close out her time at State on an up note with some special events. That’s our girl, and no one is going to change that about her. All of us here continue to pray for her complete recovery and future safety and good health – even if she is in hiding from us as she contemplates her next project. 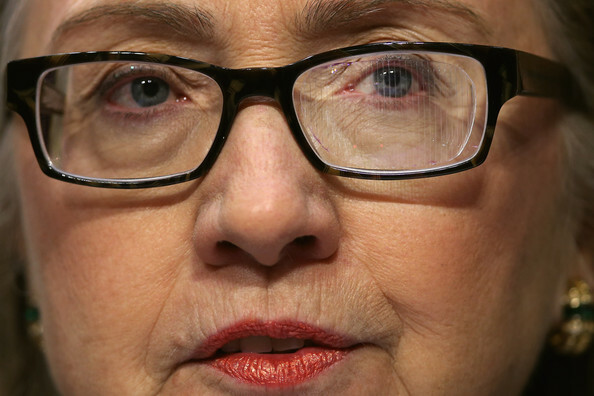 The thick glasses Hillary Clinton has been wearing in public since returning from a concussion and blood clot last month are the result of lingering effects of her health problems, a Clinton aide confirms. Oh, the poor thing!!! It must be so frustrating not to be able to see clearly. I hope that her vision is restored to normalcy in short time. Yeah, particularly because her eyesight has always been poor without the aid of glasses.